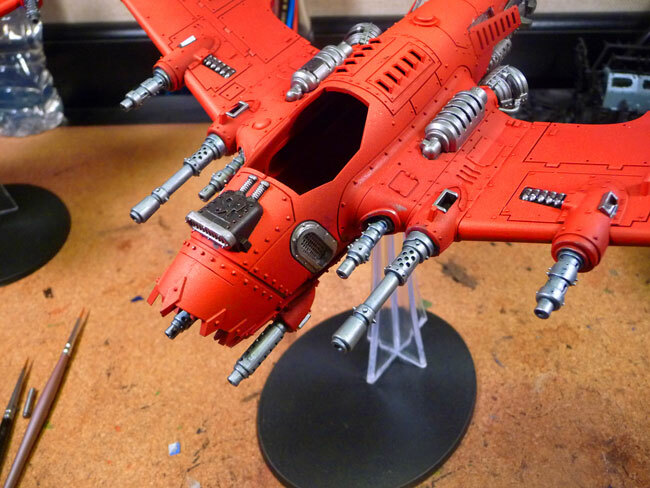 More Blasta Bommer Work – Gunna Get It Dome Someday! 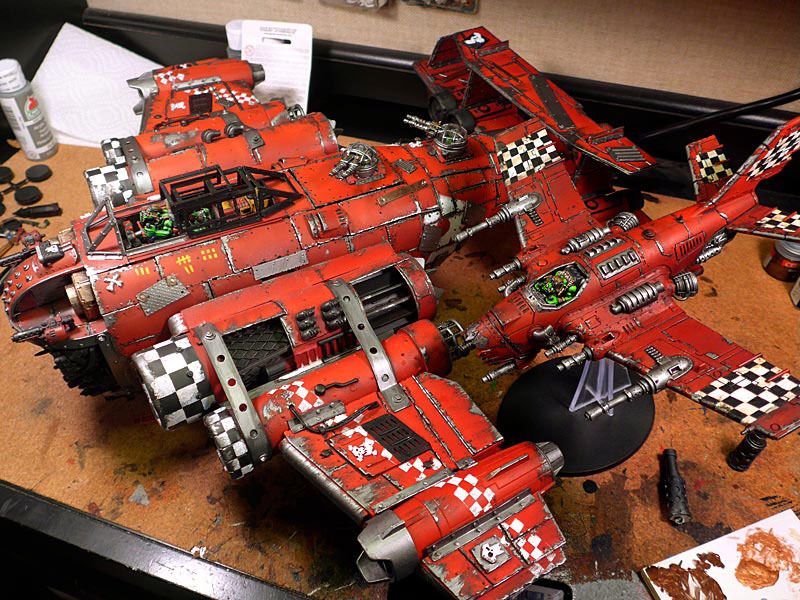 by sukigod on August, 25, 2015 in Apocalypse, Blasta Bommer, Uncategorized, Waaagh! 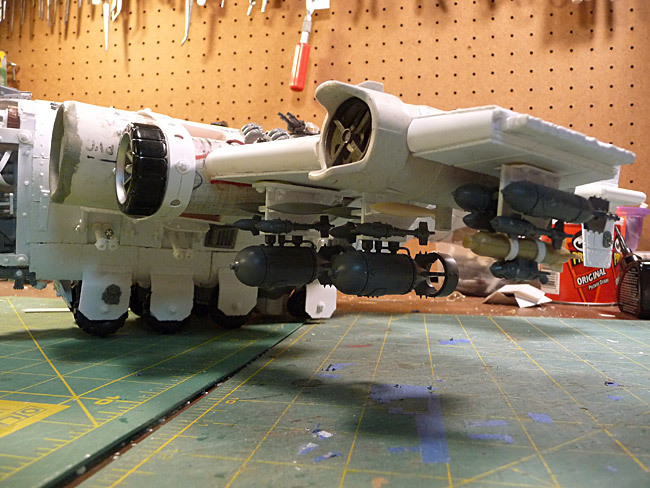 - Comments Off on More Blasta Bommer Work – Gunna Get It Dome Someday! 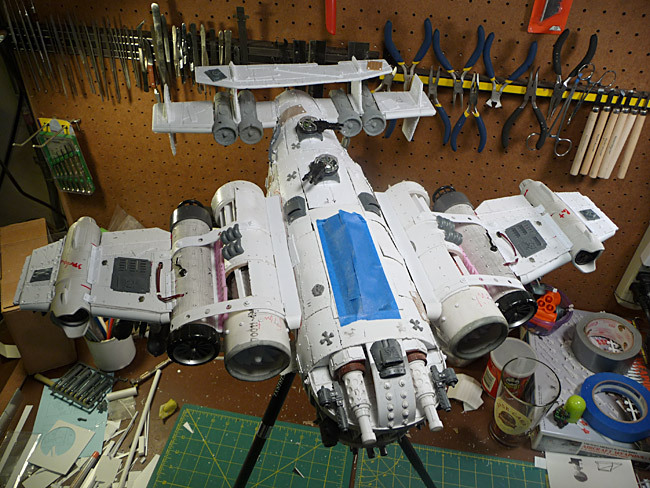 I’ve actually been working on and off on this monster for about three weeks and the only thing I’ve accomplished has been the metallic weathering. 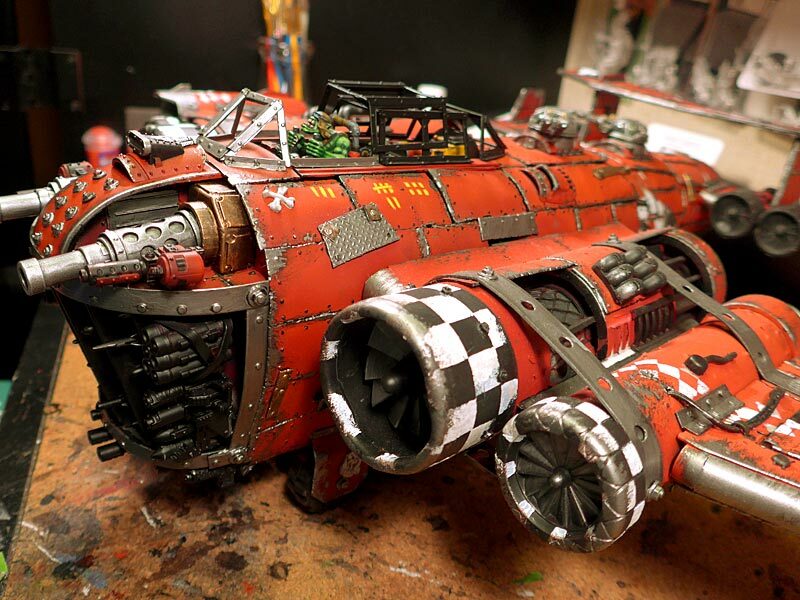 I know, not much to weathering, right? Egggad, I wish. For anyone who saw the tutorial a few years ago about my weathering using the Skullhamma’s, you’ll know it’s a long and tedious process. Sponged base/primer layer, then all hand done (with various size brushes) metals so they all stay nicely within (or trying to) the boundaries of the worn primer. ps. 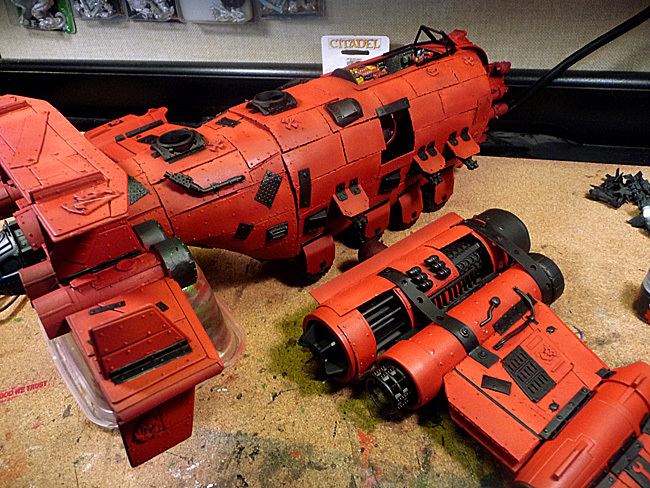 I know there’s some shots without the main Deff Arsenal kannons – they were in the process of being painted when I took these. That also accounts for some barrel droop in some photos as well, they’re only blue-tac’d on at the moment. 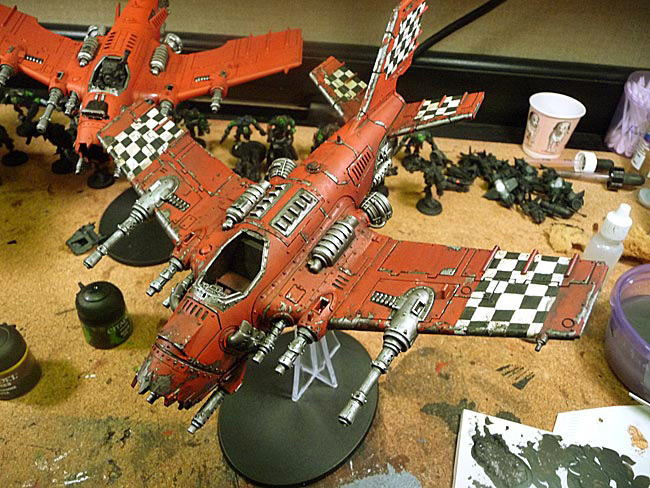 And a couple of Barry shots – one shown against a dakka jet….. This takes a long time to block everything out so be patient. I’m hoping to be doing stenciling and checks by weeks end. 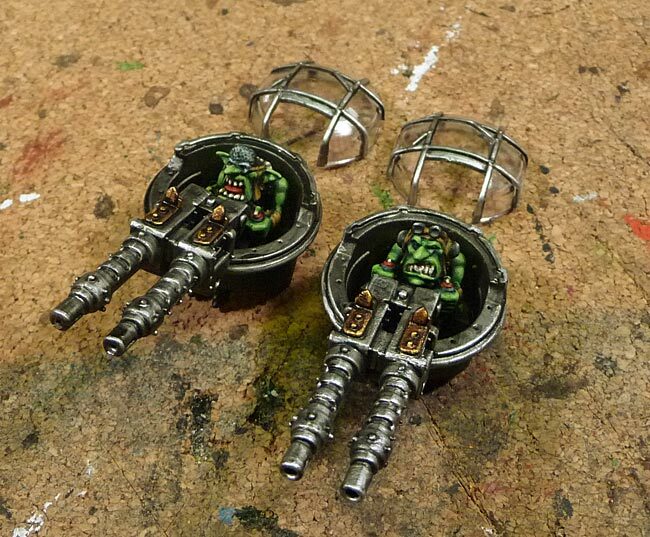 Finished up the grot big shoota gunner turrets and realized I’ve run out of Evil Sunz Red so the main painting of the bomma will have to wait until I have a chance to get to the hobby shop (hopefully tomorrow). 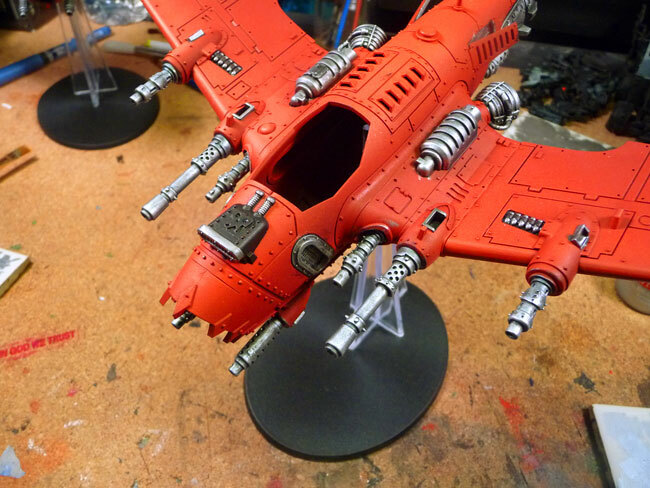 Not that I don’t have other things I can paint – wait, I do! 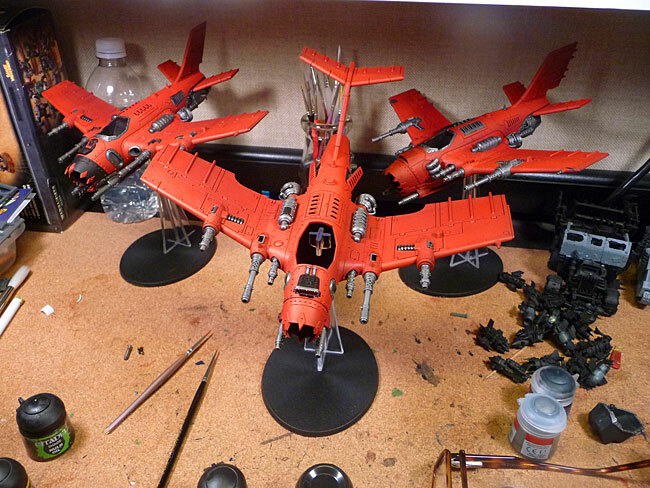 Three dakkajets I started ages ago are sitting there waiting to be finished. I’ve reached a point where I’m individually detail painting each jet to make them unique. 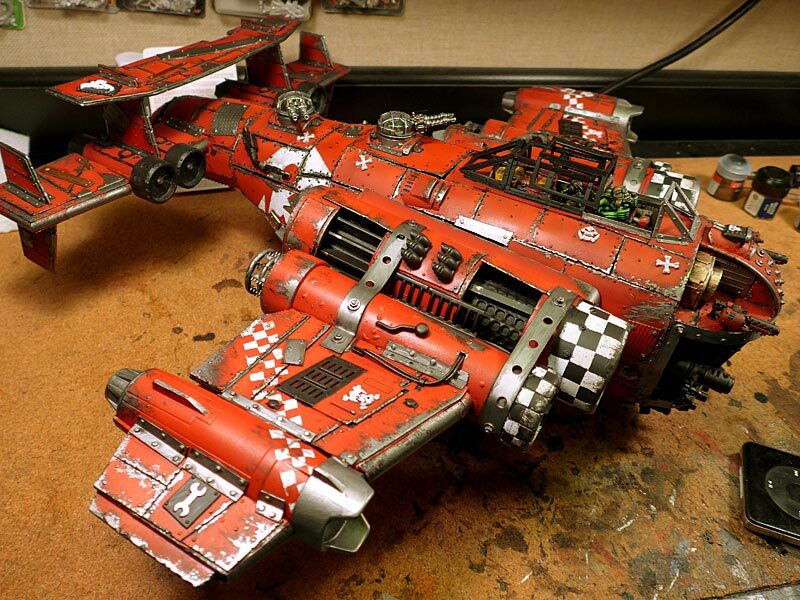 There are two rites of passage for any ork player worth his/her salt when it comes to modeling and painting. Rivets and checks. I started the checks a while back but finished cleaning them up and did the base weathering tonight. 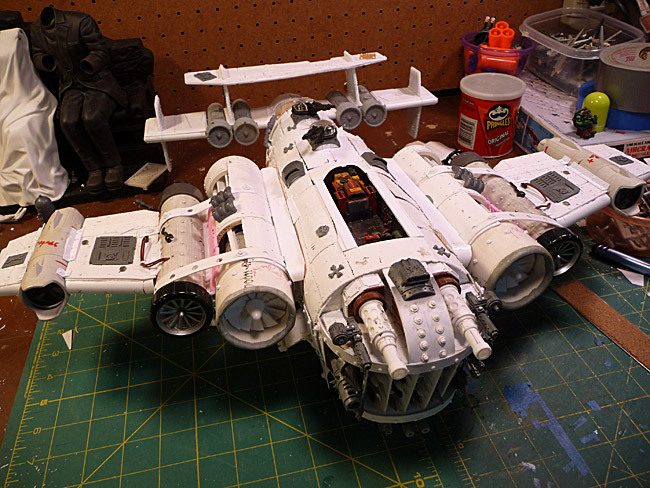 Cleaned up and ready for weathering. 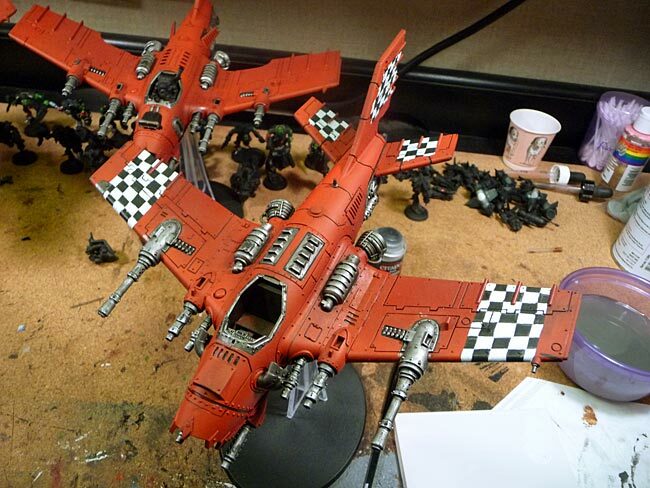 An application of watered down Gryphone Sepia over the checks – the brownish wash looks better over the white than the black og Nuln Oil, which was washed over the rest of the plane. 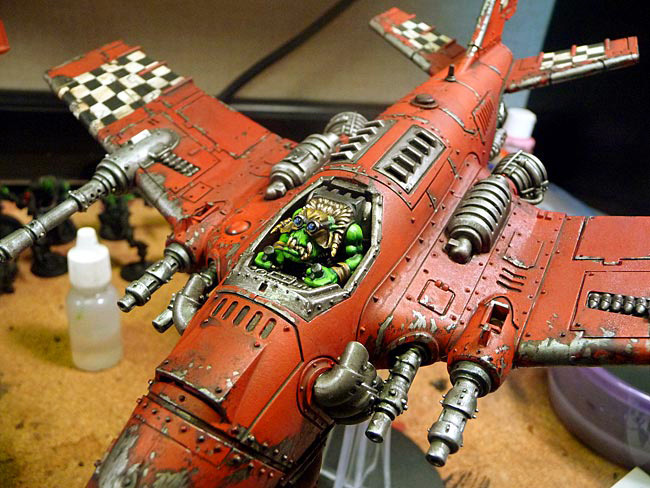 Completed Canopy on the Ork Blasta Bomma! 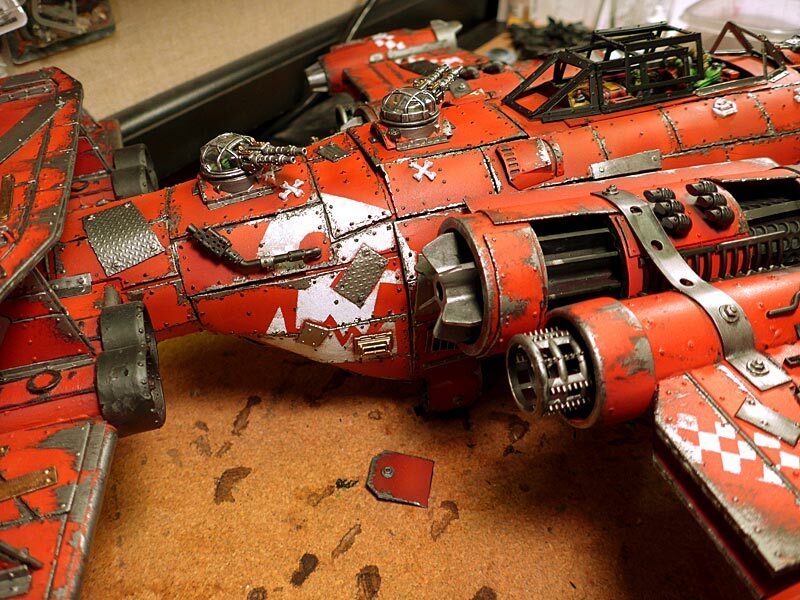 by sukigod on December, 09, 2013 in Apocalypse, Blasta Bommer - Comments Off on Completed Canopy on the Ork Blasta Bomma! Sometimes you get stuck, you come to a roadblock that you can’t blow through with ease, something that stymies you for a good long time. 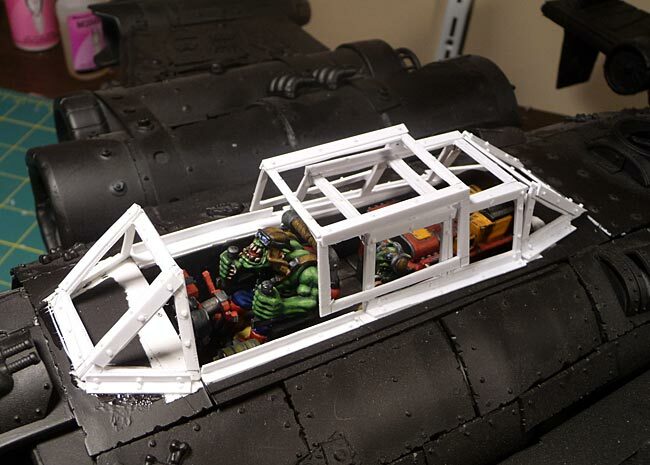 That was the canopy for the blasta bommer for me. 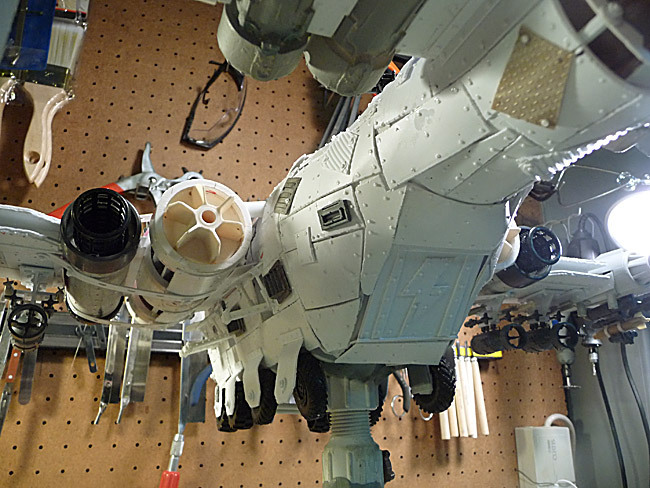 I’ve had time since I primed this beast and each time I looked at the canopy and was just blind as to how I was going to pull it off. Now, almost a year later later, I’ve got some precious time to devote to my hobby and damned if I was going to let it get away again! I threw a bunch of ideas at the wall the last four or five days and finally decided upon a path to finish the build. Here’s the overly explained steps in creating my canopy. Sure, there might have been easier ways to do it but I’m a fan of beating myself up until I figure something out on my own. 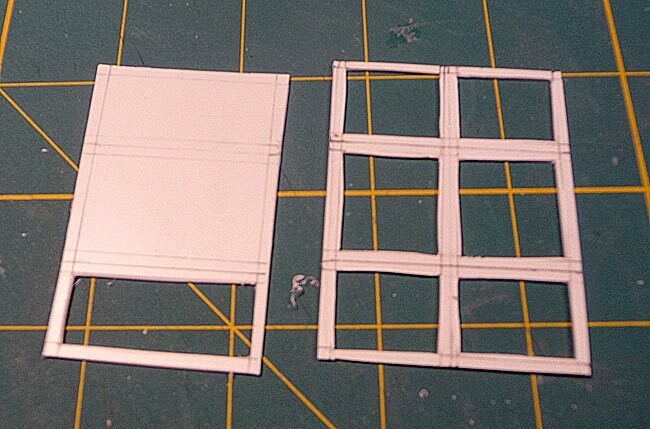 I used file card paper to construct a template (after many tries) and used it to make my canopy frames. Canopies are typically spindly, fragile pieces of metal held together by glass. 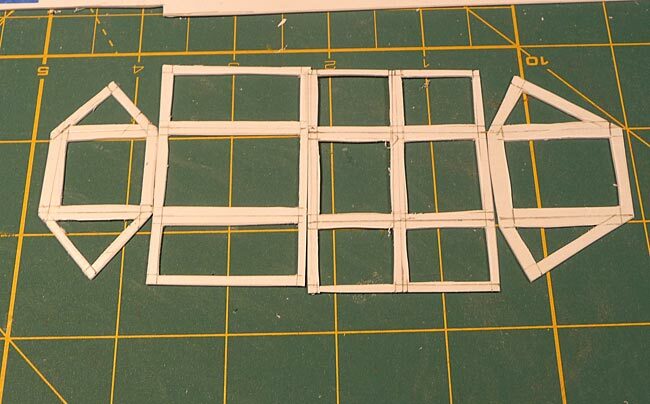 Because of this fragility, I choose to lay each peice out flat and cut the window pieces out seperately, then score them where they should angle down. 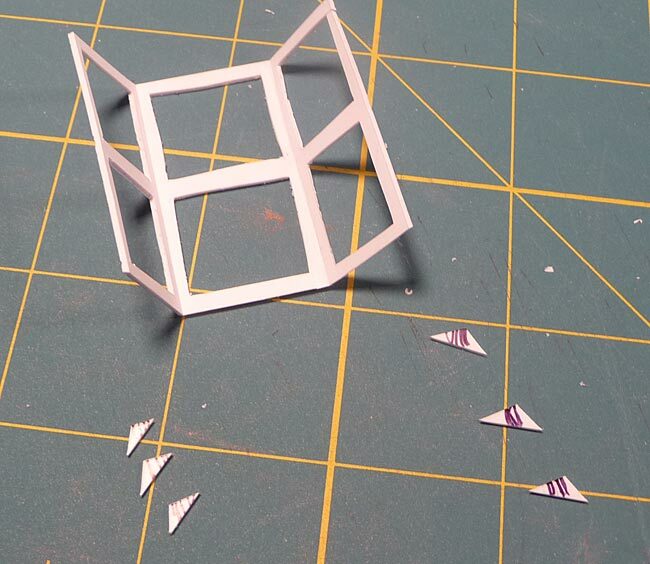 This gave the entire piece more rigidity while cutting out the windows. Here is each frame all cut out ready for scoring and bending. 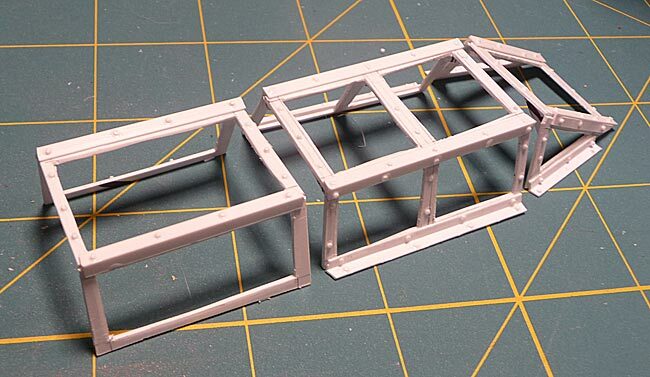 I cut little angled supports to add some structural support and to help keep the correct angle. I added some channel to the edges for support and looks, which also adds detail – a place to put RIVITS! 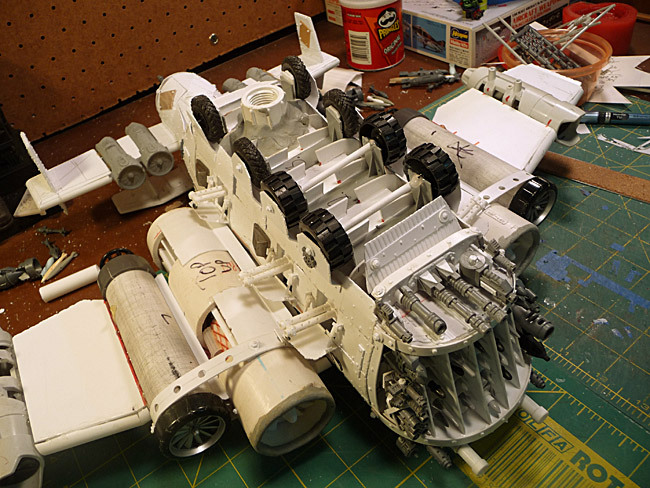 I’ve already glued the front windshield into place as I can reach the interior of it to add the glass after painting. Here’s the other assembled pieces. 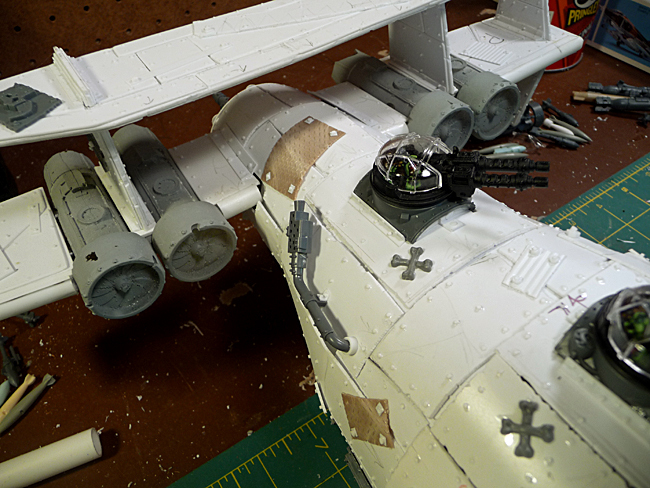 And the pieces in place on the fuselage. 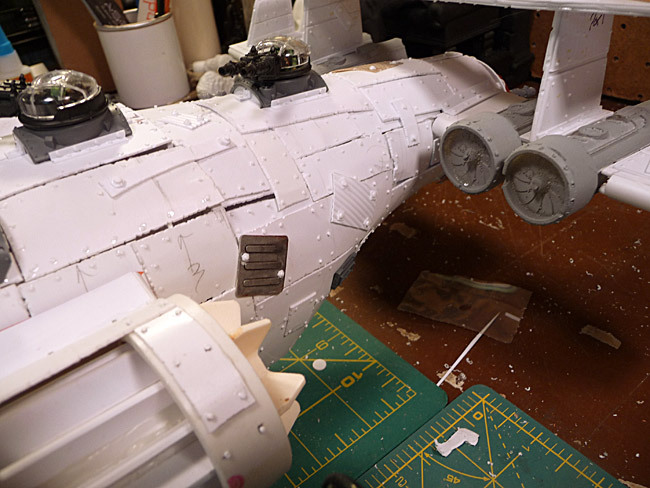 I’ll be painting these parts by hand and when I’m finished, I’ll be adding glass panes using white glue (it dries transparent without crazing) to finish up. 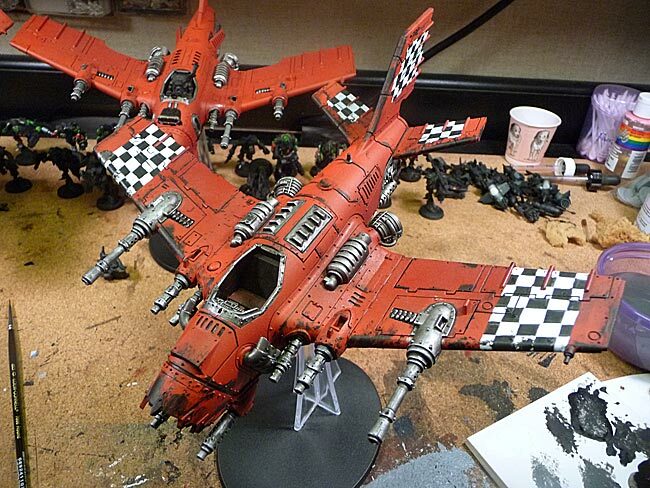 by sukigod on May, 09, 2013 in Dakkajet, Fast Attack - Comments Off on Dakka, Dakka, Dakka!!! Worked on the metallics today. I remembered a long time ago, Tamiya made a Gun Metal Blue that was really good looking for gun barrels. 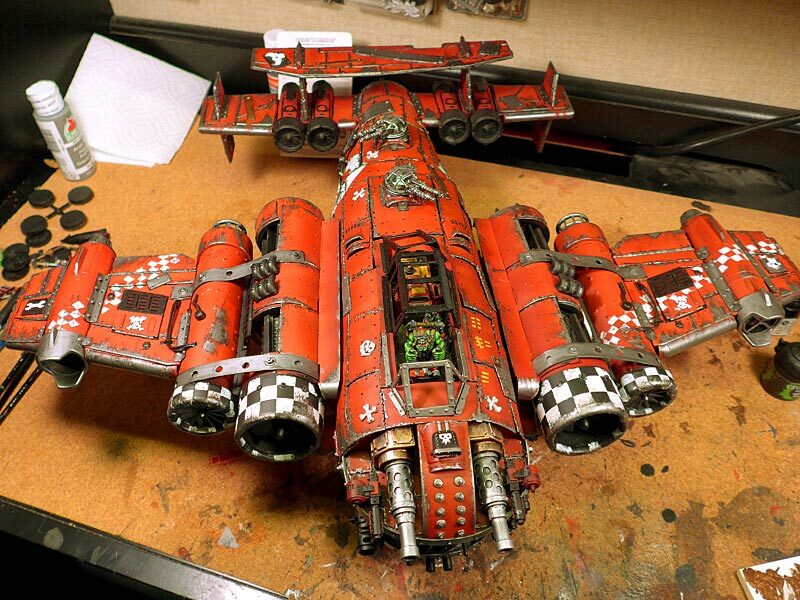 I figured I’d try to duplicate that on the many, many barrels these dakkajets have. 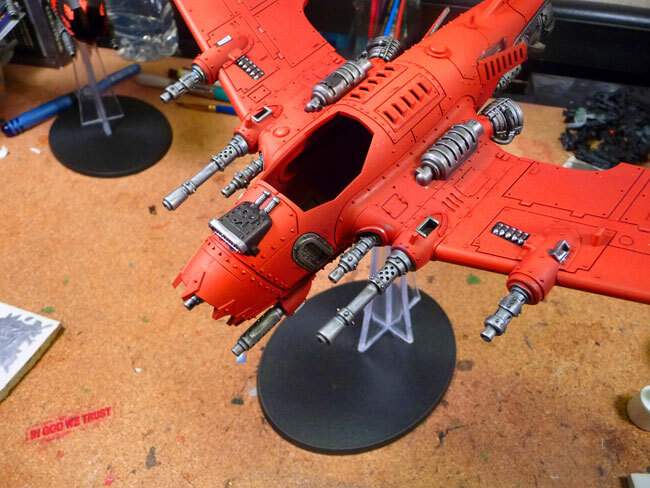 The base metal color is a 70/30 Boltgun Metal/ Abbadon Black (I miss Chaos Black). 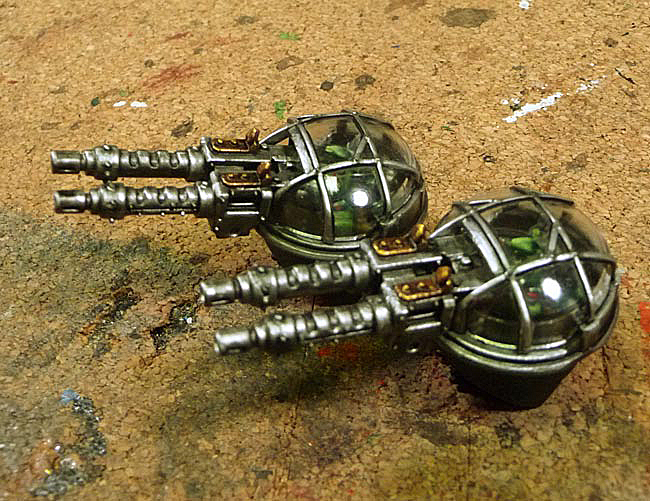 I find starting at Boltgun doesn’t give me the depth I want in my metallics so I darken it down to start. 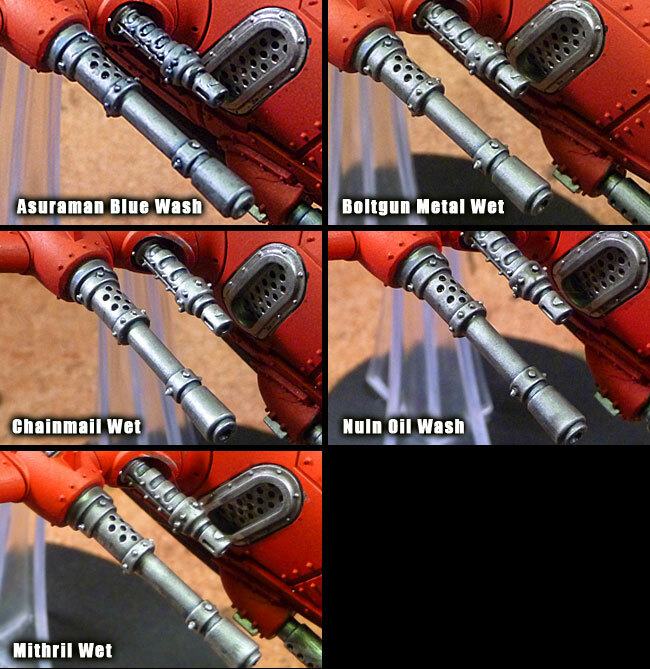 A “wet” brushing of Boltgun to start the highlighting process. Wet brushing is similar to dry brushing but he brush is wet and the paint is thinned. It tends to eliminate the chalkiness that can happen from too dry a paint. I followed this with a wet brushing of with Chainmail (I’ve got quite a few old pots sitting around). 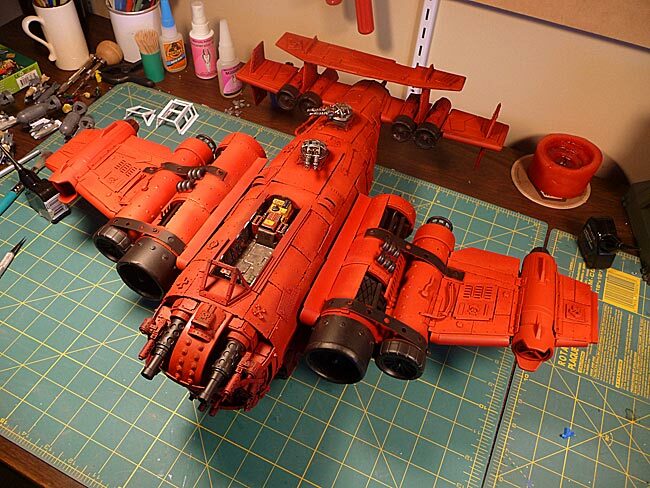 A generous coating of Nuln Oil. Followed by a wet brushing of Mithril Silver. Leaving me with a rich, blu-ish (hard to tell from the photos though, it’s metallics) with a layer of dirty grim and bright highlights. The highlights will be knocked down with the Testors Dulcote sealer. Here’s a close up side by side for each of the above steps. I think I’ll be starting the individualization of each plane next. Specific patterns and markings to more easily differentiate them and give each a little more character. 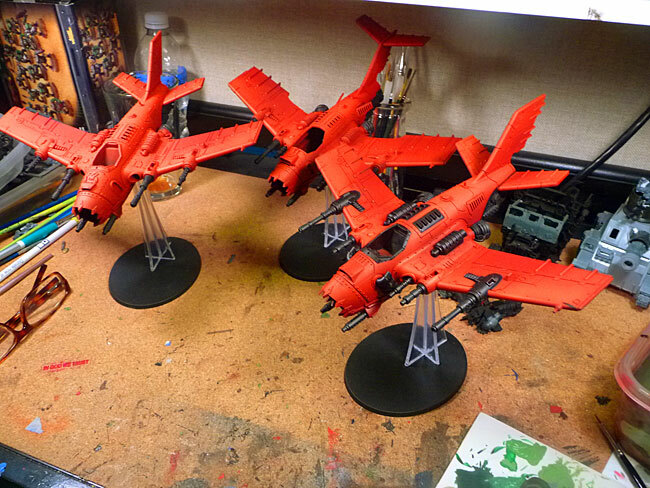 by sukigod on May, 09, 2013 in Dakkajet, Fast Attack - Comments Off on Dakkajets getting new paint! Need to slowly work back up to speed. 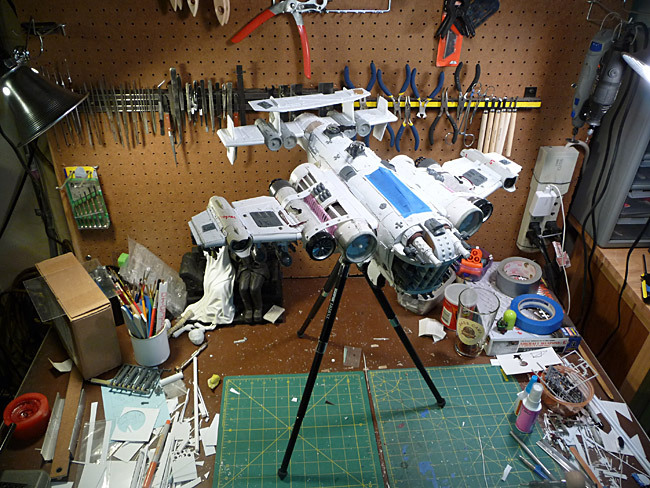 I missed my workbench! 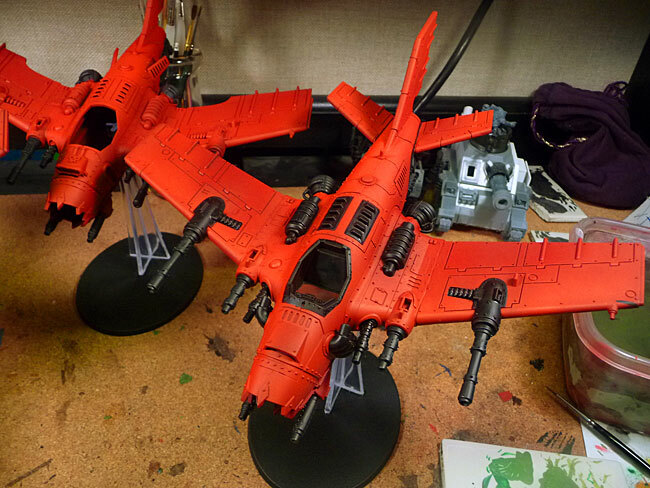 These are three dakkajets I purchased and built for the local Apoc back in January, haven’t touched anything since then. 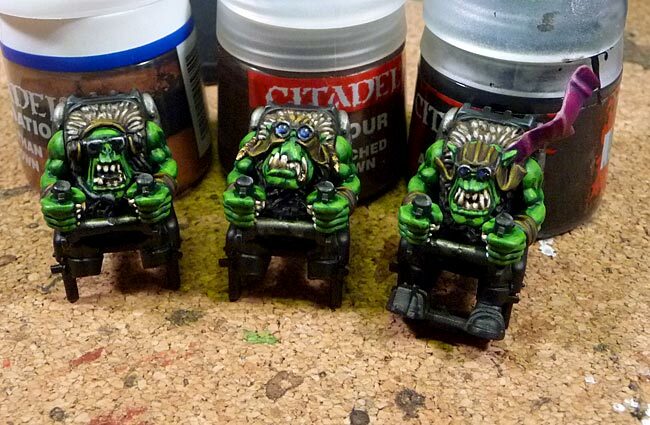 I wanted to start painting the blasta bomma but I’m using these three fellas as a test bed since most of the paint range for GW has changed since I painted anything. 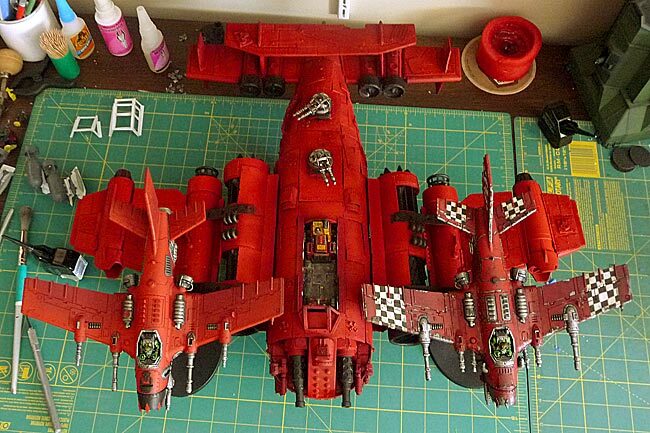 Based with Khornate Red, a layer of Tamiya X-7 and topped with Evil Sunz Red. I’m now blocking back out all the metallic areas. It’ll be slow, tedious work but a must to keep my style up. I’ve got the blocking out done on one of them. 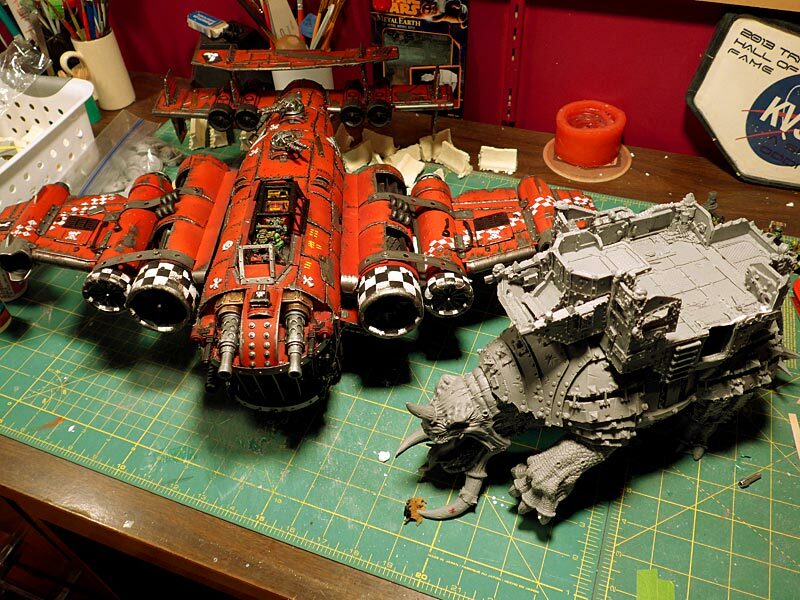 Now that school is winding down and summer is here, I can devote some bench time and get back into this crazy hobby thing again – Gork I missed it! Almost Finished! 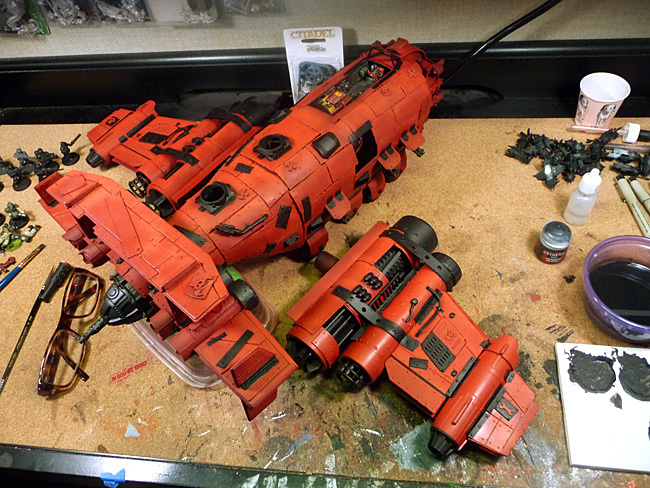 “Moar Dakka!” Starts Getting Primer! 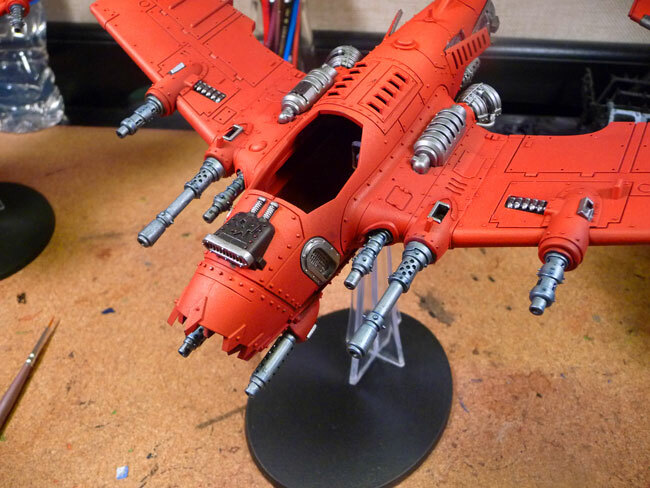 by sukigod on January, 03, 2013 in Apocalypse, Blasta Bommer - Comments Off on Almost Finished! 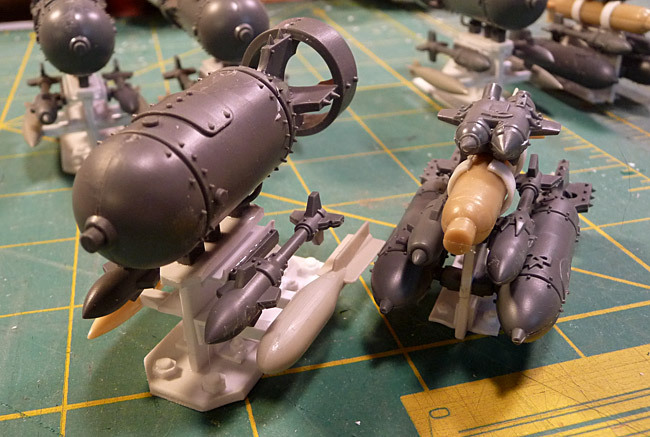 “Moar Dakka!” Starts Getting Primer! 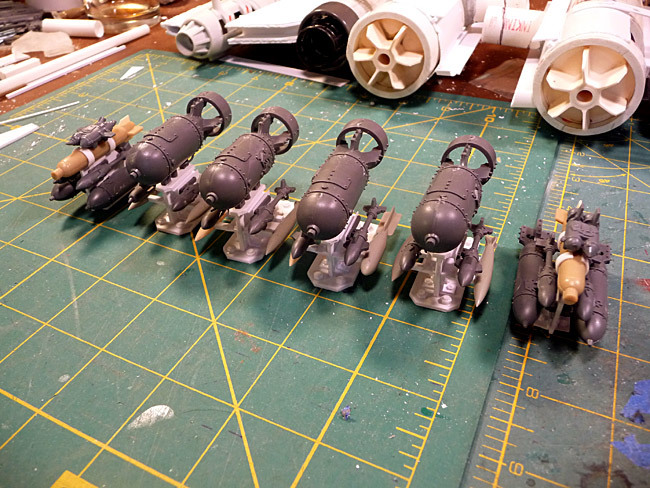 I did magnetize the bombs so I can always swap them out later with Grot bombs or other fun ordnance. 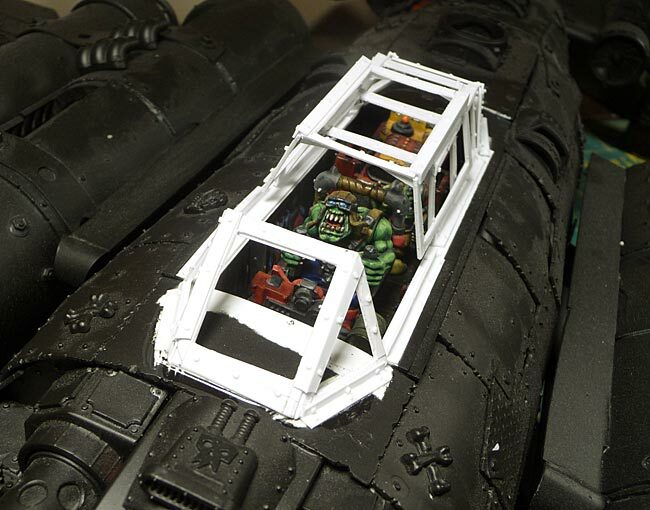 I’ve got the cockpit taped off as I’m in the process of priming now. 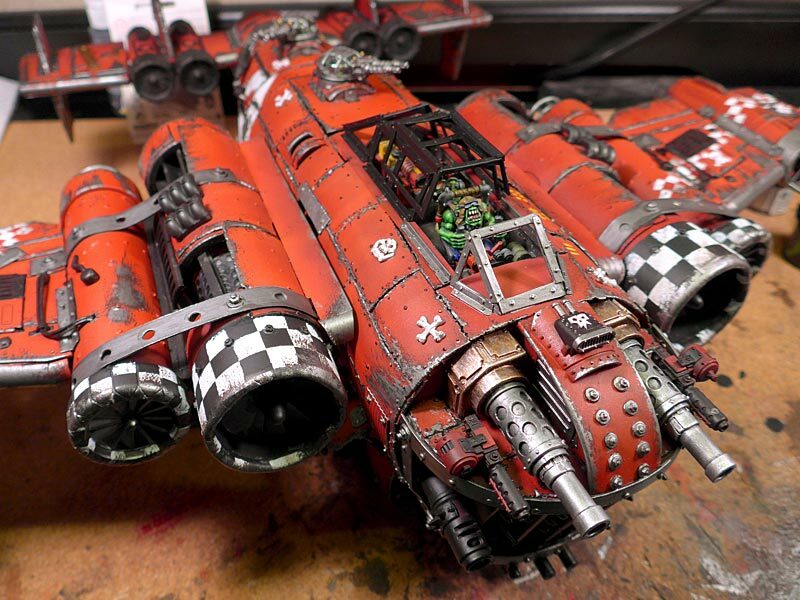 by sukigod on January, 02, 2013 in Apocalypse, Blasta Bommer - Comments Off on Ding Bombs are Done! Grrrrr. So close. I would be were I wanted to be if I hadn’t had to spend 4 hours in the ER waiting to be seen for my back. (injured it helping my brother move last weekend). 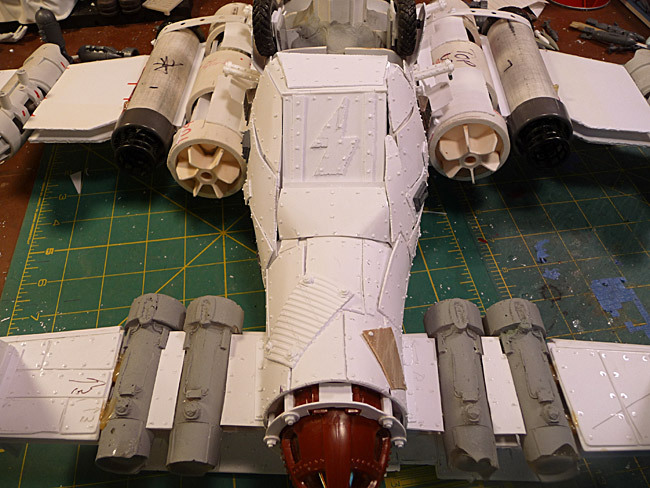 I still need to rivet the underside of the wings, glue to bomb pylons on and then I can do the canopy. That should be it for build. The canopy may have to wait til after the apoc game, we’ll see how things go. On to the pics! 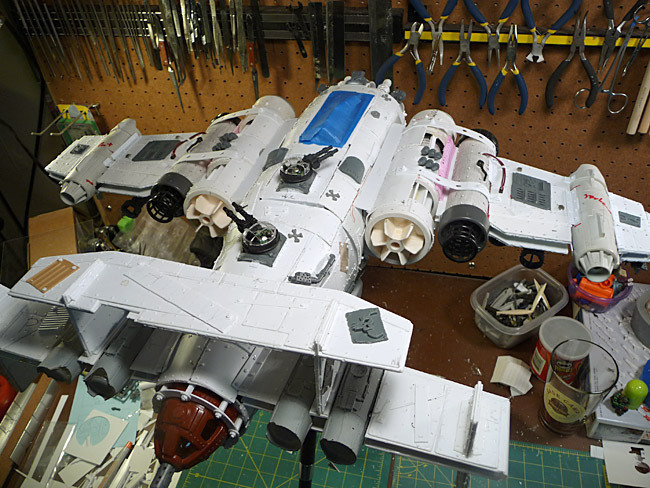 by sukigod on December, 31, 2012 in Apocalypse, Blasta Bommer - Comments Off on Bommer nearly complete! 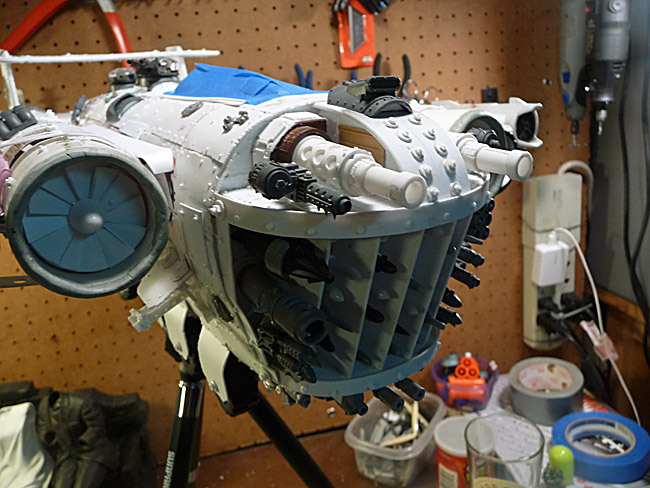 2,400+ rivets, and a couple hundred more left to do. 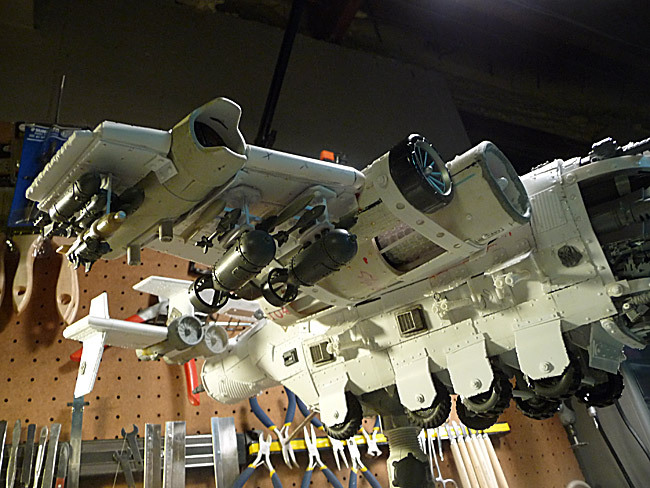 Wrapped up the tail section underside and all of the secondary plating and riveting. About 4 hours worth. Here’s where the beastie stands. 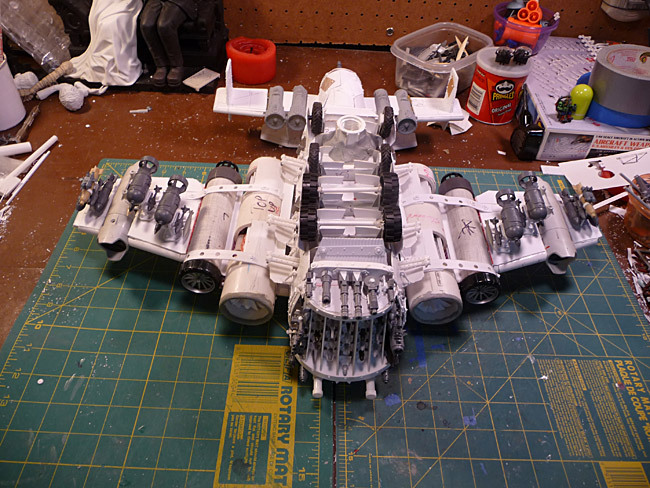 and the underside of the main wings with the clusters of bombs. 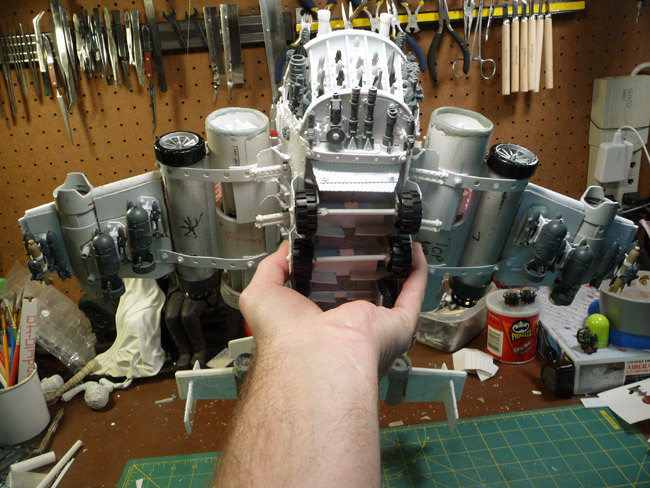 Nearly finished with the build – it’s been a long trip! 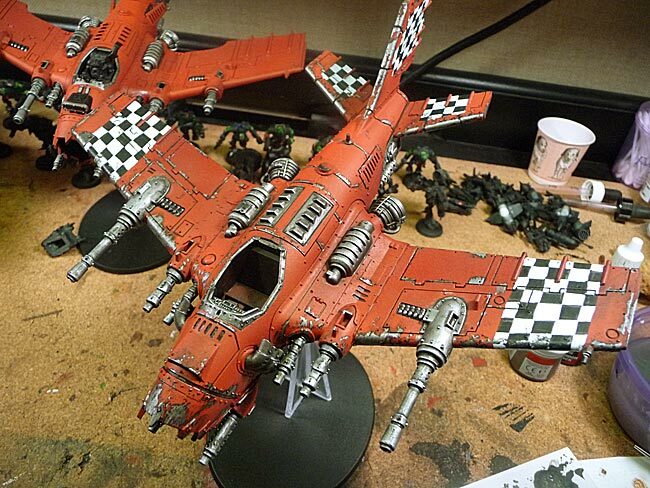 I’ll most likely be priming this the night before the apoc game on Sat. Goal met!